Posted by mbsilbs in Acupuncture, Chiropractic on 06 20th, 2017| Comments Off on Introducing: Electro-Acupuncture! Electroacupuncture is an acupuncture technique that has only recently come into use. Some scholars believe electroacupuncture was first used by physicians in France and Italy as far back as the early 1800s. Others claim that electroacupuncture wasn’t really developed until 1958, when acupuncturists in China began experimenting with it as a form of pain relief. Whatever the case, electroacupuncture is an increasingly popular form of treatment, and is used by practitioners of traditional acupuncture and Chinese medicine for a wide array of conditions such as chronic pain, muscular pain and myofascial dysfunction. It’s also extremely effective for relaxing overactive muscles, which contain trigger points. Our doctors are certified Acupuncturists and specifically trained in this new procedure. What’s the difference between electroacupuncture and traditional acupuncture? 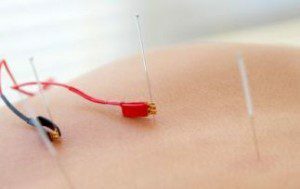 Electroacupuncture is quite similar to traditional acupuncture in that the same points are stimulated during treatment. As with traditional acupuncture, needles are painlessly inserted on specific points along the body. The needles are then attached to a device that generates continuous electric pulses using small clips. These devices are used to adjust the frequency and intensity of the impulse being delivered, depending on the condition being treated. Electroacupuncture uses two needles at time so that the impulses can pass from one needle to the other. Several pairs of needles can be stimulated simultaneously, usually for no more than 10-20 minutes at a time. One advantage of electroacupuncture is that a practitioner does not have to be as precise with the insertion of needles. This is because the current delivered through the needle stimulates a larger area than the needle itself. Patients may experience a tingling sensation while being treated with electroacupuncture, which is most likely due to the electric current. In most cases, however, the effect produced by the current is subsational; in other words, the tingling sensation will not be felt. Schedule your appointment with Dr. Jo, Dr. Andria or Dr. Mandy for this wonderful NEW acupuncture treatment today! (952) 746-8150. Carlsson CP, Sjolund BH. Acupuncture for chronic low back pain: a randomized placebo-controlled study with long-term follow-up. Clin J Pain Dec 2001;17(4):296-305. Casimiro L, Brosseau L, Milne S, Robinson V, Wells G, Tugwell P. Acupuncture and electroacupuncture for the treatment of RA (Cochrane Review). Cochrane Database Syst Rev 2002;(3):CD003788. Ewies AA, Olah KS. The sharp end of medical practice: the use of acupuncture in obstetrics and gynaecology. BJOG Jan 2002;109(1):1-4. Irnich D, Winklmeier S, Beyer A, Peter K. Electric stimulation acupuncture in peripheral neuropathic pain syndromes. Clinical pilot study on analgesic effectiveness. Schmerz Apr 2002;16(2):114-20.